I did Passover a little differently this year. I did it on the west coast, for one, and I did it without the usual crowd — no Aunt Lissie, Mom, Dad, sisters, original girl cousins, or any other east coast family, for that matter. Lucky for me, I have family, both real and makeshift (which, let’s be honest, also counts as real), here in the Bay. There were 10 of us at last night’s Seder (a little late, yes, but no matter – Elijah still came), only two of us actually Jewish, but all of us open-minded and enthusiastic. We drank wine, we said prayers, we ate matzoh balls, and we tore through our hosts beautiful apartment in search of the Afikomen. We told the story of Passover, drank more wine, and ate flourless chocolate cake while singing Happy Birthday, competing with each other to see whose voice sounded best. I don’t want to say we’re bad singers, but the Happy Birthday contest probably could have been the 11th plague. Was it unconventional? Yes. Was it perfect? Yup. 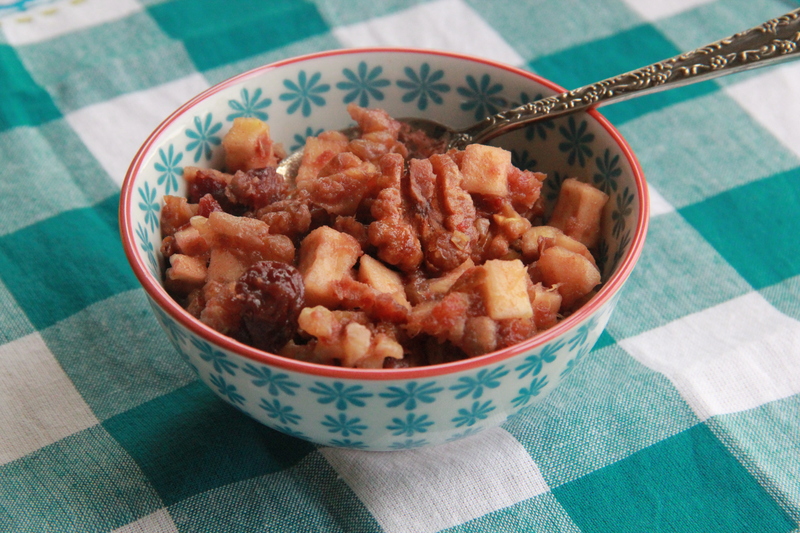 Over on the east coast, my sister Casey is usually the one responsible for making the charoset, a sweet apple walnut salad that takes its place on the Seder plate as a symbol of the mortar the enslaved Jews used to build Pyramids in Egypt under Pharoah’s rule. Casey adds medjool dates to her salad, which I love. This is my version of Casey’s charoset. You’ll notice I use regular wine (Pinot Noir) instead of sweet wine (Manischewitz) — somewhat blasphemous, maybe, but I think the sweetness of the orange juice and honey are a sufficient contrast to the acidic fruitiness of the Pinot and the toasted nuttiness of the walnuts. Preheat oven to 350 degrees F. In a medium saucepan, combine the orange juice and red wine and bring to a simmer. 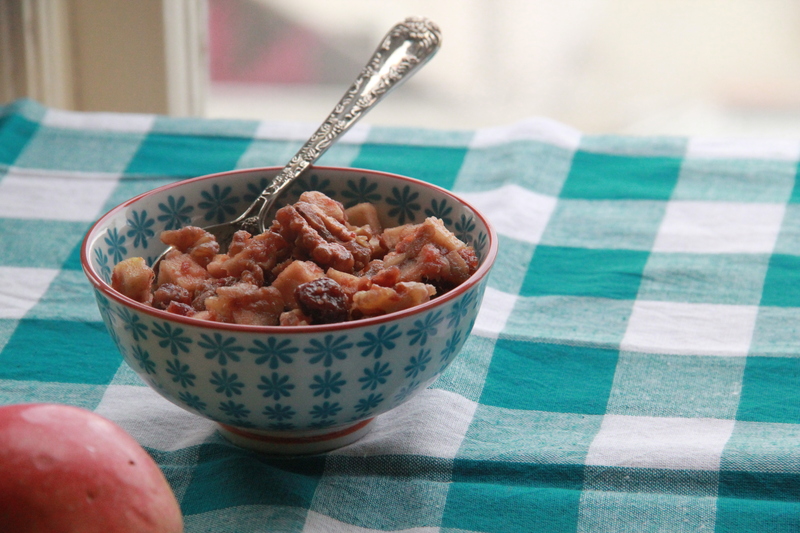 Once hot, whisk in the honey, salt, and cinnamon, and add the dates and dried cranberries. Stir together over medium heat and allow to gently simmer, until most of the liquid has been absorbed by the fruit. Remove from heat and allow to cool slightly. While the date mixture cools, roast the walnut halves on a sheet pan in the oven until lightly browned and fragrant. Set aside to cool. In a large bowl, mix together the chopped apples and lemon juice. Add the dried fruit mixture and stir to combine. Add the cooled walnuts, stirring to incorporate. Cover the charoset and let sit in the refrigerator at least 4 hours or overnight. Serve chilled. Makes about 4 cups salad.